Dia of steering wheel cover is approximate 15inch (from outer edge to edge). Insulates hands against hot and cold extremes. Lots of fun! Great as gift idea. Slip on installation, no lacing required. Great for Taxi's or Cars Doing High Mileage. Prevents Wear on Original Steering Wheel. 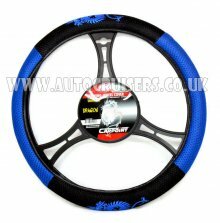 Steering wheel covers do not come with any model guide therefore we are unable to confirm any exact suitability or compatibility on any model. If not suitable we offer full refund under our 14 days return policy. To assist we have provide the approx dimensions and have taken our own images to show the closest shade or style.